Get ready because Valentine’s day is sneaking up quick. If you still need to make plans here are some fun local discounts. Auntie Anne’s: Use this printable coupon to get buy-1-get-one pricing on heart-shaped pretzels (Feb. 14 only). Baskin-Robbins: For a limited time, enjoy the $5 Love & Kisses Sundae, which features scoops of Cherry Cordial and mini Hershey’s Kisses candy. Plus, get $3 off Valentine’s Ice Cream Cake with a minimum $15 cake purchase with code SAVE3. Blue Apron: Subscribe to this meal kit service, and cook Valentine’s Day dinner with your sweetheart without the stress of ingredient-shopping. On the menu for Valentine’s Day week are seared steaks with roasted potatoes, honey-lime tilapia and more. New customers get a discount. Bonefish Grill: Through 2/17, Bonefish Grill will serve this Valentine’s Day special: filet and Lobster Thermidor (a wood-fired filet mignon and jumbo shrimp topped with sweet lobster chunks in a creamy Thermidor sauce, served with a choice of two signature sides). Buca di Beppo: Heart-Shaped Lasagna for two (with salad, bread and dessert) for $49.99 on 2/14 Carrabba’s: The Valentine’s Special is $45 and includes a four-course dinner for two. Available Feb. 4 through 17. Chick-fil-a: Get a heart-shaped tray of 30 or 10 Chick-n-Mini sandwiches at participating locations. Chili’s: The Valentine’s Meal for Two is $25 and includes an appetizer, two entrees and a cheesecake or skillet chocolate chip cookie. Chuck E. Cheese’s: Order Chuck E. Cheese’s via DoorDash on Feb. 14 and get free delivery and a goody bag (while supplies last). No promo code required. Dairy Queen: The Dipped Strawberry Cupid Cake (with chunks of Ghirardelli chocolate) is back at participating locations for a limited time. 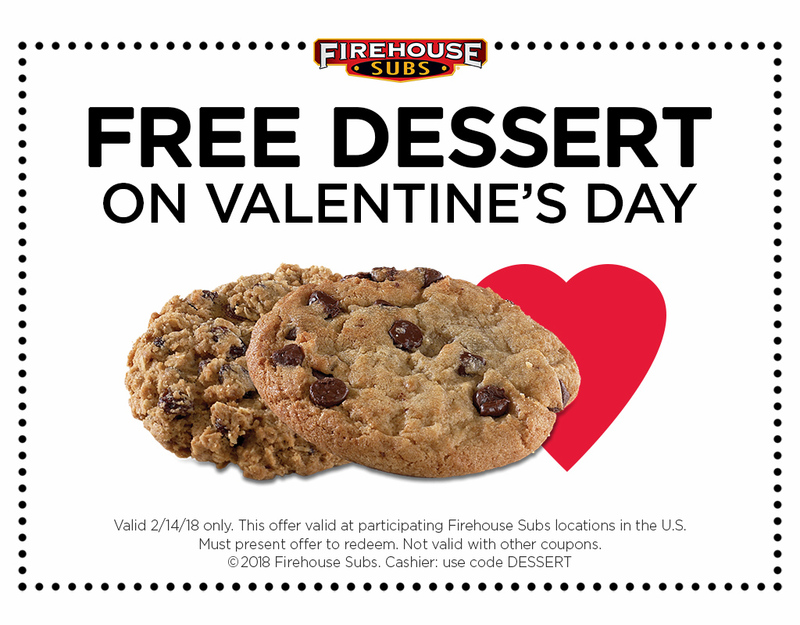 Dunkin’ Donuts: Heart-shaped donuts at participating locations through 2/14 Firehouse Subs: On Feb. 14 only, get a free dessert with any purchase at Firehouse Subs by using this printable coupon. HelloFresh: Enjoy a relaxing dinner at home, cooking with your loved one. This meal-prep kit service gives you $80 off your first four orders(that’s $20 off each order). The menu options for Valentine’s Day week include cherry balsamic pork chops, roasted garlic herb penne and more. Hooter’s: The annual Shred Your Ex promo takes place once again this year on Feb. 14. Bring in a photo of your ex to shred, and get 10 free wings when you buy 10. Hungry Howie’s: Feb. 11 to 14, you’ll be able to purchase a heart-shaped pizza for $6.99 using promo code HEART1 when you order online. Or, use promo code HEART2 to order the “2 Hearts are Better than 1” combo deal, which includes a heart-shaped pizza and heart-shaped cheese bread for $12.99. Instacart: Dining in? Order groceries needed for a romantic home-cooked meal with free delivery by signing up for a 14-day trial of Instacart Express. Jack in the Box: Get a free five-piece order of Mini Churros, NY Style Cheesecake or regular shake with any purchase via the Jack in the Box mobile app on Feb. 14. KFC: In what’s perhaps the most unique Valentine’s Day promo this year, KFC has partnered with Reddit to give away various prizes (including a Colonel Sanders bearskin rug and a date night package that includes a year’s subscription to an online streaming service of your choice). Krispy Kreme: Valentine’s Day themed doughnuts available Macaroni Grill: Get a three-course meal for two for $45. Chose one antipasti, two entrees, one dessert and a featured wine. Maggiano’s: The That’s Amore Valentine’s Day Feast for two includes choice of appetizer, flatbread, two side salads, two entrees and a dessert. Available Feb. 9 through 15. McAlister’s Deli: Kids eat free on Valentine’s Day. Get a free kids meal for up to two children ages 12 and under with the purchase of an adult entree. The Melting Pot: Free 6 ct Signature Chocolate-Covered Strawberries with $60 purchase if you sign up for Club Fondue Olive Garden: Dinner To-Go for 2 for $35.99 on 2/14 Outback Steakhouse: 4-Course Aussie Dinner for 2 on 2/13 – 2/17 Plated: Through Feb. 14, first-time subscribers to meal-delivery service Plated can use promo code BEMINE to get free dessert for a year. Use the promo code and sign up by 11:59 p.m. on Valentine’s Day, and a year after, you’ll be able to add a dessert from the Plated menu at no additional cost when you place your order. Romano’s Macaroni Grill: Three-course dinner for 2 for $45 per person on 2/14 Steak ‘n Shake: Valentine’s Day Milkshakes + 1/2 Price Shakes Weekdays from 2-5 Texas Steakhouse: Unlimited shrimp for $15.99 on 2/14 TGI Friday’s: Order from a special Valentine’s Day menu Feb. 6 through 19 at participating locations. The menu includes ribs, chicken parmesan pasta, pot stickers, red velvet cake and more. Waffle House: On Feb. 14, these locations will celebrate Valentine’s Day by setting the tables with special menus, tablecloths and soft lighting. Barnes & Noble: 10% Off Online Order with code FEBLOVE through 2/11 Flirty Aprons: Select aprons on sale for $5 Edible Arrangements: 20% off orders of $35+ with code 20BERRY at checkout (orders placed by 2/9) Cheryl’s: 6 Free Cookies + $10 Reward Card (just pay $6.99 shipping) Mrs. Fields: Mrs. Fields is offering 20$ off Valentine’s Day cakes from February 1 through February 7 with code “HEART” on their website. DaySpring: Valentine’s Day Gifts Fandango: Free bouquet of flowers from Bouqs with any ticket purchase Manly Man Company: If long-stem red roses just won’t do, buy a beef jerky bouquet for your one true love. The Manly Man Company has options starting from $49. Michael’s Kids Club: Valentine Slime Craft for kids from 1pm – 3pm on 2/9 (free) or Frame Craft from 10am – 12pm on 2/9 (costs $2) Lowe’s: 11% Mail in Rebate available until 2/16/19 1800Flowers.com: $20 off $39.95 purchase when you pay with MasterPass Target: For a limited time, save $5 when you spend $20 or more on select Valentine’s Day candy at Target using in-store pickup. When browsing Target’s grocery section online, you’ll see items eligible for this deal labeled. Walmart: $10 off any $50 grocery purchase if you want to cook at home!